All natural resources – your own blood! What is -Platelet Rich Plasma (PRP)/Vampire Procedures? Anyone who is using cosmetic treatments for lines, wrinkles, poorer skin condition and general skin reconditioning can be improved with platelet rich plasma therapy or PRP. And anyone who has had problems tolerating products for these sorts of procedures will be encouraged by the fact they are using purely their own cells and tissues. A small sample of blood is painlessly drawn from your arm and spun down in a centrifuge to separate the PRP from the remaining blood components. 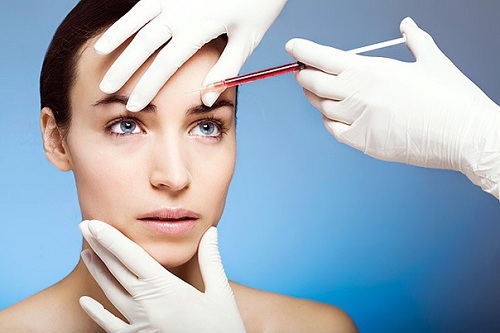 The PRP is then applied to the skin during the Micropen treatment. PRP can also be injected directly into specific areas of the skin for targeted improvement of under-eye circles/darkness, deep wrinkles, and scars. PRP is excellent for improving skin texture, deep wrinkles, scars, and post procedure healing time. The most dramatic results so far have been in the crepey skin problems in areas such as under eyes, necks and decolletage areas. It is not designed to replace surgery for loose skin where procedures such as blepharoplasties etc would be more appropriate. What’s the Difference Between PRP and PRFM? The value of PRP is long established. A new technique, which some are referring to as the “next generation” of this treatment, is known as Platelet Rich Fibrin Matrix (PRFM). PRP is prepared by spinning blood that has been drawn from a patient in a centrifuge. This separates the blood platelets and plasma from red and white blood cells. Another step is added to this process to create PRFM. Calcium chloride is added to the plasma that has been separated, with the result that a gel-like substance is created. This difference in the structure of the material makes it possible for the PRFM to remain in the body longer. While PRP can support healing for a day or so, PRFM can continue to provide healing benefits for up to a week. In addition, the PRFM process reduces the presence of white and red blood cells. These have the potential to cause inflammation and other unwanted effects. PRFM is not a dermal filler, but it can be used to treat very fine wrinkles or reduce dark circles under the eyes. It can also be used on acne scars and as a regenerative hair loss treatment to improve the health of hair follicles.